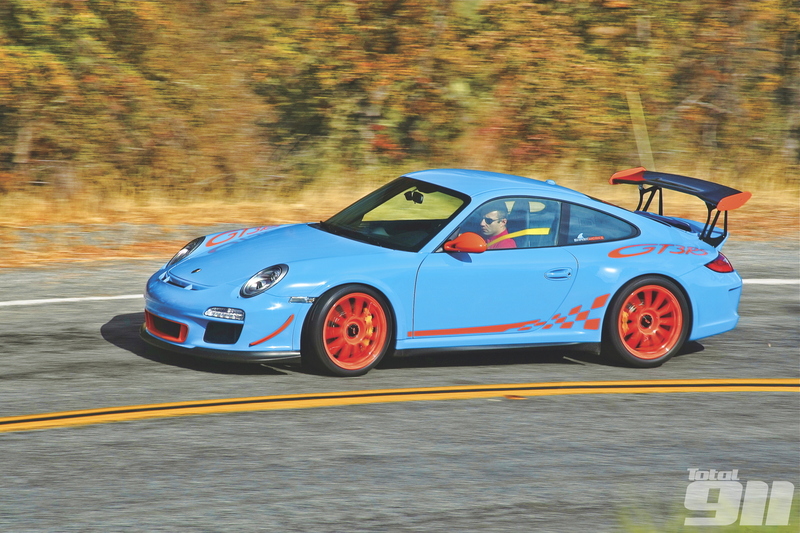 My first acquaintance with the blue-and-orange SharkWerks 997 GT3 RS was in November 2011, shortly after Alex Ross and his team took delivery of the car. Barely run in and in 3.8-litre specification at the time, it had just received the SharkWerks exhaust, ECU, suspension, plus wheel and tyre upgrades. I used it as the reference point for their 997 GT3 3.9, and one of their more lightly tuned 997 GT3s. With even more power and torque than the factory 4.0-litre RS, which I had driven that summer, the GT3 3.9 was a most impressive motor, and I came away from my first visit to the Fremont-based Porsche tuner with more than a little reverence for their work and enthusiasm. Fast-forward to late 2013, and Alex had emailed me to say that their 4.1-litre conversion on the GT3 RS was finally ready to be driven. Having been impressed with the 3.9-litre conversion in the GT3, I was expecting fireworks from its bigger Rennsport brother, and I was not disappointed. The 4.1 proved deeply impressive from the word go, oozing power and torque everywhere. It quickly became obvious that you could drive everywhere one gear higher than the factory 3.8 GT3 RS for any given speed, with plenty of ‘go’ on tap if you needed to accelerate away quickly. The big-displacement motor simply makes everything more effortless, and will pull strongly from just 1,200rpm in fourth. In fact, if you could slip the clutch enough to pull away in fourth, you could drive everywhere in that gear within all normal road speed limits. You only have to look at the torque curve to see why. The 4.1 makes between 85-105Nm more torque than the factory 3.8 GT3 RS between 2,900- 5,300rpm. Crucially, this is also substantially more than the factory 4.0-litre RS, which peaks at only 30Nm more than the 3.8 with 460Nm at 5,750rpm. Subjectively, the SharkWerks 4.1-litre RS feels quite different from any other tuned Porsche GT3-based road car I have driven before or since. To read more of our SharkWerks Porsche 997 GT3 RS 4.1 test drive, pick up your copy of Total 911 issue 122 in store now. Alternatively, you can order online for home delivery, or download it straight to your digital device.